Discussion in 'Dedicated Source Components' started by NickedWicked, Dec 21, 2017. Packed into the compact half 19” format factor, this little gem is filled with the finest high-end electronics, offering a reference class conversion from SPDIF coaxial, SPDIF optical (ADAT compatible) and USB to RCA, XLR, TRS and mini-TRS. As the most versatile DAC available, the ADI-2 DAC offers balanced/unbalanced analog outputs, an Extreme Power headphone output, a super low noise IEM output, SteadyClock FS, 4-stage hardware output level control, DSP-based signal processing, external power supply operation, Class Compliant USB compatibility and sample rates up to 768 kHz as well as DSD and Direct DSD playback. The SPDIF input signal can even be recorded via USB - as one would expect from RME the DAC is a true 2 channel Full Duplex audio interface. With the DAC RME engineers took the opportunity to slightly enhance the DAC's analog output stage to be even more perfect as it already was. More relays, a different double symmetrical attenuator circuit and one additional buffer OP amp succeed in less noise and less THD. As the DAC-chip is the limiting factor here this is hard to measure, but nevertheless an important improvement, especially at lower hardware output levels typical for Cinch/RCA usage. The new hardware reference levels of +13 dBu, +7 dBu, +1 dBu and -5 dBu also add to this. The headphone revolution not only brought headphones but also IEMs (in ear monitors) back into the attention of audiophiles and music lovers. Modern IEMs have a reference sound that easily competes with bulky over-ear headphones, making them not only a mobile alternative, but also an interesting solution in home. Modern IEMs are extremely sensitive and operate on very low voltages. As a side effect they uncover the noise floor of the player, DAC or headphone amp. When RME developed its Extreme Power headphone stage the basic noise floor was taken care to be as low as possible. Which was then confirmed in many reviews (most black background…). Even when used with IEMs. Still RME wanted to make sure that even the most sensitive IEM combined with the most sensitive listener receive the full dynamic range on playback. Also capable outputs like the Extreme Power ones are not fully safe against operating errors and might blow up ears or IEMs. RME's solution: adding the most advanced IEM output imaginable as second phones connection to the front of the ADI-2 DAC. Its ground noise floor is an astounding 10 dB lower than the one of the Extreme Power output (black hole background…), output impedance is near zero Ohms, THD reaches new record lows, click-free on/off is included as well as volume ramp-up, and the sound quality with any IEM is just amazing. We're sure you will love it! The ADI-2 DAC is the first device in RME's range with SteadyClock FS. There is not much to improve with SteadyClock, it has earned its accolades over years of flawless operation in numerous RME devices, guaranteeing that using the internal clock will produce exactly the same sound as when using an external one. SteadyClock highly rejects jitter and handles all digital interface formats in an exemplary way. That's why SteadyClock's design and behavior didn't change in the DAC. With SteadyClock FS the focus was put on reducing the self jitter of SteadyClock to new lows, by improving its second, analog PLL circuit, and referencing both Direct Digital Synthesis and PLL to a low phase noise quartz crystal. The self jitter measured through DA conversion now reaches levels that usually are only available in master quartz clock mode, while SteadyClock still always runs in PLL mode - no matter if internal or external clock, sound is exactly the same (again). The low phase noise oscillator driving the updated circuit reaches jitter specs lower than a picosecond (ps), an area called FemtoSecond. Hence SteadyClock FS. The ADI-2 DAC comes with a remote that is not the usual cheap add-on. This nicely designed remote control has clearly labeled buttons, readable even in low light conditions without reading glasses, a nicely laid out button arrangement that is easy to remember, and perfect button ergonomics. Plus: It won't interfere with your ATV or other devices. The DAC remote offers buttons for Standby On/Off, Volume, input selection (Optical, Coaxial, USB) and Mute. Four programmable buttons are added that can be assigned with 20 different functions and commands for total flexibility. There is no other DAC or similar unit with such a sophisticated, easy to use and versatile remote functionality! The ADI-2 DAC includes an improved SteadyClock, a fine-tuned to perfection analog circuitry, remote control, Extreme Power headphone output and a very special IEM output. It has all the bells and whistles that made the ADI-2 Pro famous, including its perfectly transparent sound signature and full DSP processing with Bass, Treble, Loudness, 5 Band Parametric EQ, Crossfeed and much more. With its simplified operation and stunning design it is the ideal center piece from home listening up to studio reference playback. Do you know if the analog output bypass the volume pot now ? If I remember correclty it wasn't possible on the ADI-2 PRO. The volume is digitally adjusted, hence you bypass it by going to +0dB or whatever's the level your amp likes the best. We need to liberate the worms from their cans! Looks like this is starting to ship. I should have one tomorrow from ZenPro Audio (never used them before. Will update here if I run into any issues from them, but I had a nice phone chat with the owner before placing an order to ensure they were actually in stock). ^ I look forward to hearing your thoughts on this sounds. DA Filter options including FR curves and impulse responses to show you what they do (in the manual). I mightprefer "Slow," even over NOS. You can diagnose your USB! Super useful for peace of mind. USB diagnosis field right in the MADIface driver control panel. Bit Test will tell you if anything went wrong when you playback their super quick test files. The best manual I've ever seen for any hi-fi product. OMG I love reading it. They also give you a nice glossy-paper ringed manual with it. Something fun to thumb through while listening. Exceptionally clean, even from USB. Built-in 5 band parametric equalizer that shows you exactly what it's doing. Has 20 slots to save and the ability to instantly recall previous settings (back and forth) to listen for changes. Nice remote with programmable buttons. 9 Setups that you can save (and factory default) and recall. You can set and save every setting on the thing apart from EQ, then program these to the 4 programmable remote buttons to very easily swap between settings. Do I prefer the Slow filter with a bit of Crossfeed or SD Sharp with no Crossfeed? One button, boom. Display settings can be changed to have a dark background instead of the default light. You can swap the default state screen between State Overview (cool stats), a really nice FR spectrum display, or a simple display that shows volume and basic output info. You can also turn on auto-dark to turn off the display 10 seconds after you adjust something on the unit (3 seconds if you change something via the remote). I'm liking this more than any DS DAC I can remember. Could be because it's paired with better gear otherwise. As a transportable unit, this thing is unbelievably good. You can run it off a battery pack (not included) if you need to use it in a portable situation. Doesn't need a nice power supply because it cleans everything up internally. This is probably the best single unit setup I can imagine for using at the office. It's compact, cleans up USB, cleans up power, works with full-size cans and IEMs, and doesn't look garish at all. For PRT fans, you can invert phase of both or either channel on the unit instead of doing it in software. The DSP is before the DAC, so the DAC and anything its connected to should benefit from the Phase Reversal Trick. A feature I won't use but that would be great for some is that you can record S/PDIF (coax, optical, or AES with an adapter) into the USB. I think this means you could use a CD player to record stuff? I dunno. Might be useful for some guitar FX units. Neat feature: The faster you turn a knob, the bigger steps the value takes. One notch, when turned slowly, is 0.5dB of volume. Turn it fast, and one notch is several dB. The headphone output on this is quite a bit better than I was anticipating. Better than most solid state amps I've used. It's a shame that the size of the unit doesn't allow for an XLR output since the DAC is balanced. Maybe in a v2 in a few years, they can relocate the power button and squeeze a balanced headphone out in. The intelligent Loudness function is pretty slick. Basically, you set the bass and treble gain levels of the loudness feature, then set the minimum volume at which it reaches those boosts. As you approach the threshold, it interpolates how much boost is needed to retain some punch and sparkle even at lower volumes. Bug: If you rapidly swap between coax and USB inputs (for me, that means swapping inputs every couple of seconds to compare their sound), after several swaps the USB goes into robotic music through spring-loaded tin cans mode. I think that means it loses sync with the clock (it uses the internal clock for USB and slaves to external input via coax). If I go back to coax for a couple of seconds then back to USB, it corrects itself (as does stopping/starting the music). Quirk: It seems to present itself as a different device to Windows for every sample rate. I noticed because switching to a 96kHz album from 44.1 suddenly started piping the Overwatch League game I was watching through the ADI-2 DAC because Windows always makes new devices the default (simultaneously with JRiver ASIO, so kinda cool that it can do that). Checking my playback devices showed that it didn't have the custom icon (RME logo) or name I gave the device, then I noticed that 96kHz was the only sample rate shown. Sure enough, it does this once for each supported sample rate (then Windows remembers your settings for that SR from then on). Doesn't seem to do it for DSD. Speaking of DSD... you can do direct DSD via line outs only since you're not allowed to manipulate the volume. It silences the headphone outs if you turn on DSD Direct. I believe it converts DSD to PCM internally if you leave it off, which is default. The menus recall where you last were when you go back to them. The screen is nice and crisp on the unit and menu navigation and manipulation is really nice after you acclimate to it. In addition to the parametric EQ, you have bass/treble knobs. You can define the cutoff frequency and Q factor. I love the integration of some of the old school things like Loudness, Bass/Treble, EQ, and balance controls brought up to modern spec. It's like an homage to old receivers, but reimagined as alien technology. The USB on this thing really is pretty stellar. It's at least in the same playing field as Schiit Gen 5. I'm pretty sure I still prefer the Lynx AES16e feeding it AES via coax, but it's good enough to not get too much nervosa over using it. I'm a little bit in love with this thing right now. It's not just the honeymoon period, it's the wedding night. The tech on the ADI-2 DAC is astonishingly good. It's so freakin' versatile. JKDJedi, cardeli22, HailToTheKing and 6 others like this. What dac chip does it use? AKM AK4490, or at least the Pro version does. Would be surpised if they've changed the chip for this model. Very interested in your impressions on sound quality Luckbad! As a long-time RME user I think I can explain this. It's not really a quirk, and it also is not the unit - it is the Windows driver, and the behavior is intentional. Every time you change the sample rate the driver removes all its WDM devices and installs new WDM devices that support (only) the new sample rate. Therefore you can not change the sample rate while using WDM with whatever software running in the background - desaster guaranteed. This scheme had been introduced by Echo (as far as I know) and has been taken over by some other companies as well. It is a workaround for the sample rate control no longer possible from the record/playback app (since Vista, IMHO). It is unavoidable for multichannel and fully ASIO/WDM multiclient devices. Should also be mentioned in the manual. Windows stores the current Speaker configuration (2 stereo to 8 channel surround device) per device and per sample rate. So drivers that do not use this trick will have only one Speaker configuration, while RME's will have one per sample rate. Now the new DAC does only have 2 channels, so in my opinion a different scheme would be possible. But it uses the MADIface series driver, which happens to work this way. Changing that you would also loose the ability to use the DAC together with whatever other interface of RME's range supported by this MADIface series driver, and that's quite a lot. Oh man, I'm loving this sub-$2000 setup. It's exceptionally clean while still alluringly musical. 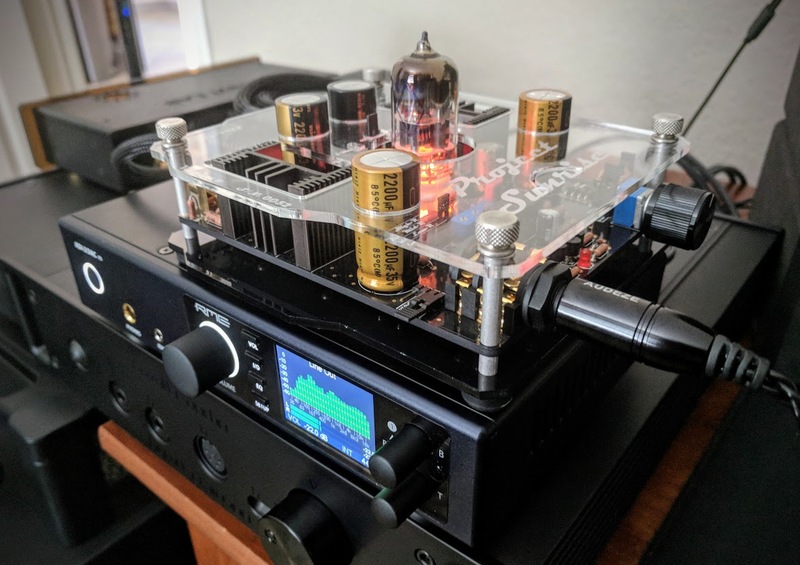 You can go from über clean solid-sate using the ADI-2 DAC's headphone output to added tube magic with the Project Sunrise III. I'm using the Jan Meier crossfeed setting on the DAC as well as inverting the phase on the right channel for the Phase Reversal Trick (PRT not pictured; I swapped to the HD650 with XLR a few minutes ago). The USB input on the ADI-2 DAC is very good. While I slightly prefer using the Lynx AES16e with it, it's really unnecessary for all practical purposes (no digitus, it's just a bit less delineated and deft with the "micro"-stuff). The power--despite involving two switched-mode power supplies--is tremendously clean. The Noise Nuke is virtually as good as a linear power supply with the G2127 amp to my ears, and the internal power section of the ADI-2 DAC cleans up the power you feed it. Noise floor is dead silence. I can max out the volume on the ADI-2 DAC and the Project Sunrise III and hear nothing without music playing on Audeze LCD2 Classics. Engage Loudness on the ADI-2 DAC and you can knock the volume way down while working on something that demands focus without losing bass impact and treble sparkle. 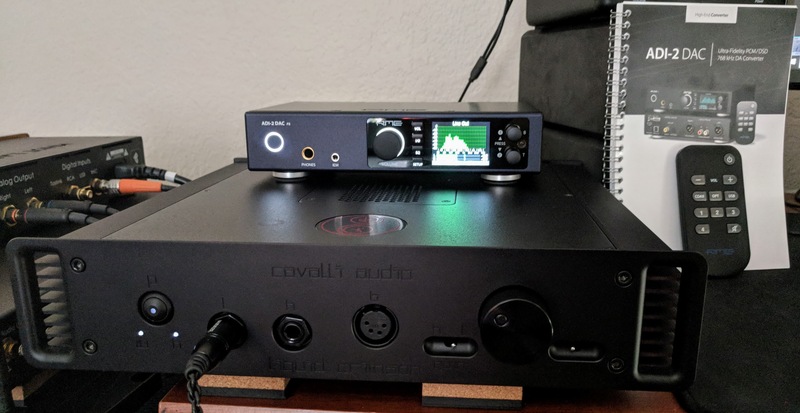 For all but the absolute best recordings, this setup is as good with the Project Sunrise III as it is with the Cavalli Liquid Crimson (which pulls ahead on the most demanding music). triggsviola and JKDJedi like this. Nice report again! Would you mind to explain the Phase Reversal Trick (PRT)? I must have missed this as it doesn't tell me anything. Thanks for the reports.... I'm about to order one of these too so your impressions are very welcome. Though I plan to use it as a DAC/Pre with speakers. @johnjen could explain it best. In short, the idea is to more efficiently and completely utilize the full power capacity of an amplifier, and the available rail-to-rail potential difference/swing, by driving left and right channels in opposite phase/polarity within the DAC/amplifier, and then correcting phase/polarity before getting to the headphone (we do it in the headphone cable, with a simple adapter). In theory, driving the channels in offset like this will cause less sag against each rail and draw current from both of them independently, rather than in a common mode. At headphone power levels, the relative power demand differences are not going to be huge, but then we’re not dealing with very much available power to begin with. The ADI-2 DAC makes it very easy to reverse the phase of one channel, and it does it in DSP before the digital to analog conversion, conferring the full benefits of PRT. The PRT is really for my amplifier that comes after the ADI-2 DAC, not the ADI-2 DAC itself.